MONTREAL -- ADF Group Inc. says uncertainty over U.S. steel tariffs reduced orders and prompted it to introduce work-sharing for employees at its Quebec plant. “Backlog growth is paramount to our success and unfortunately the uncertainty surrounding the steel import duty was a game-changer for many of our clients and negatively impacted our capacity to successfully close major bids during the first quarter," co-chairman and CEO Jean Paschini said during a conference call. The company announced temporary layoffs at the end of March. As of Monday, about 120 employees at its Terrebonne plant have seen their working hours cut 40- to 60-per cent and will receive Employment Insurance benefits to offset the reduction. ADF said the program approved by the federal government will allow the company to manage its costs until steel fabrication work begins on recently awarded projects. "As the U.S. trade policy on steel became somewhat clearer and uncertainties subsided in the following weeks we were able to secure $95 million worth of new contracts in the United States before the close of the first quarter," he told analysts. 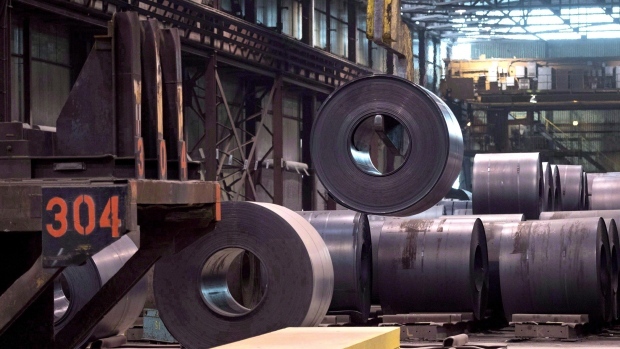 The Trump administration imposed 25 per cent tariffs on imports of steel and 10 per cent tariffs on aluminum against several countries effective March 23. It initially gave Canada, Mexico and the European Union exemptions, but those were lifted June 1, prompting a retaliation from the Canadian government. Paschini said the company is looking for every opportunity to improve the efficiency of its plants and has a strong pipeline of potential new contracts. "No doubt the road ahead will be challenging but as we did in the past we will continue to work hard, roll up our sleeves to adapt to a prevailing market condition and trend." ADF lost $910,000 or three cents per share in its fiscal first quarter as revenue dropped by more than 40 per cent year-over-year. The loss compared with a year-earlier net income of $354,000, or one cent per share. Revenue for the period ended April 30 fell to $28.5 million from $48.6 million because of a drop in business volume, as certain fabrication projects were nearly completed before newly-signed contracts were started. Its order backlog was $158.7 million, up from $85.5 million at Jan. 31. The backlog includes $95 million worth of contract awards in the United States that were announced on April 23. In addition to Terrebonne, ADF has plants in Great Falls, Montana and Miami, Florida.